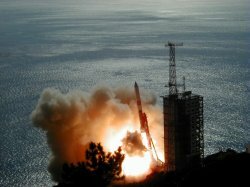 Astro-E was launched by the M-V-4 rocket from the Kagoshima Space Center of the Institute of Space and Astronautical Science at 10:30(JST) on February 10, 2000. However, there was a malfunction of the first stage motor. The satellite could not pick up the necessary speed for a circular orbit. The detail report can be found in the ISAS Web page. We would like to express our appreciation to the people who supported us, have been interested in the Astro-E mission, and those who have sent us thoughtful emails after the failure. It is a great loss not only for us, who spent more than 6 years for the preparation of Astro-E, but also for the X-ray community around the world. We believe the science we wanted to research with the high resolution spectroscopy and broad band spectal observations will still be an important science several years from now. Thus, we are going to propose to launch a satellite just as Astro-E or an Astro-E-like mission as soon as possible. Of course, there are difficulties in building an M-V rocket and in getting the budget from Japanese government. We would like to ask for your continuous support in our effort to get Astro-E-II. This page will be kept in order to show (1) general description of Astro-E, (2) Record of the pre-flight activity, and (3) Future plan for Astro-E-II. Please keep watching.